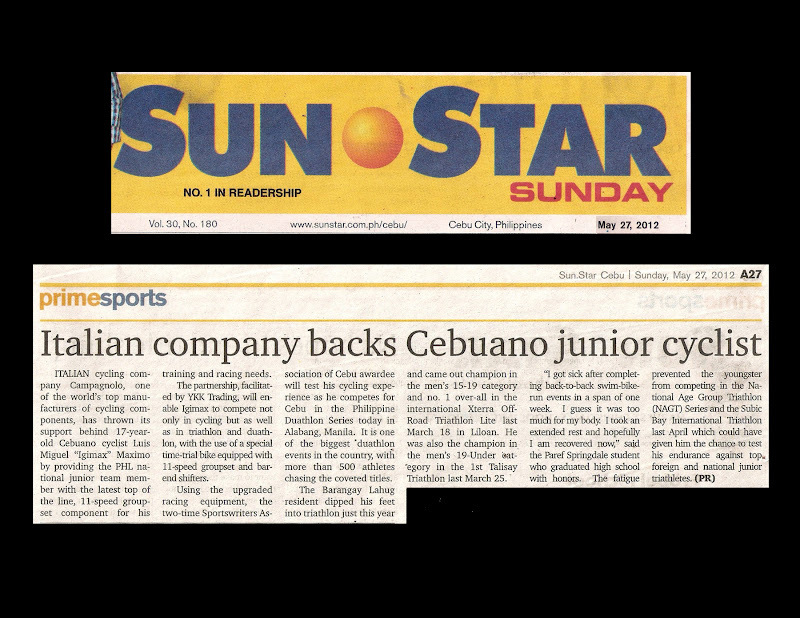 Italian cycling company Campagnolo, the world's top manufacturer of cycling groupset components, has thrown its support behind 17-year old Cebuano cyclist Luis Miguel "Igimax" Maximo by providing the PHL natl junior team member with the latest top of the line, 11-speed groupset component for his cycling training and racing needs. The partnership, facilitated by YKK Trading, will enable Igimax to compete not only in cycling but as well as in triathlon and duathlon, with the use of a special time-trial bike equipped with 11-speed groupset & bar-end shifters. Using the upgraded racing equipment, the two-time Sportswriters Asoociation of Cebu awardee will test his cycling experience as he represents Cebu in the Philippine Duathlon Series today in Alabang, Manila. It is one of the biggest duathlon in the country, with more than 500 athletes chasing the coveted titles. The Barangay Lahug resident dipped his feet into triathlon just this year and came out champion in men's 15-19 category and no. 1 over-all in the international Xterra Off-Road Triathlon Lite last March 18 in Liloan. He was also the champion in the men's 19-under category in the 1st Talisay Triathlon last March 25. "I got sick after completing back to back swim-bike-run events in a span of one week. I guess it was too much for my body. I took an extended rest and hopefully I am recovered now," shares the PAREF Springdale student who graduated high school with honors. The fatigue prevented the youngster from competing in National Age Group Triathlon (NAGT) Series and the Subic Bay International Triathlon last April which could have given him the chance to test his endurance against top foreign and national junior triathletes.